Quest clients have different dietary needs, preferences, and lifestyles. We know how important it is to provide a variety of items so they may choose what they want. We are always looking for ways to offer more food choices to all of our clients, including those with special diets. We are excited to be able to now offer dairy-free cheese products from our new food supplier partner, Daiya Foods. Daiya cheese products are free of dairy (casein, whey and lactose), soy and gluten, and are certified vegan (free of all animal products). They also provide cheese alternatives for people with food sensitivities that prevent them from using traditional dairy products. Our taste test of the Daiya dairy cream cheese spread was unanimous: delicious! We really enjoyed the flavours and textures. This is a high quality product that we heartily recommend. – Patricia Holm, Quest Client. The Daiya website includes a number of delicious recipes using their products. One we particularly like is Easiest Mac & Cheese Evah. It was great meeting the staff from Garden Protein International, GPI, at our 2020 Dundas Street location on Friday January 29, 2011. They are very nice folks who really care about helping others. I’m glad they got a chance to work with their own products and to hear some feedback about how their products are helping people here at Quest. During their time here I was able to explain how the Gardein products benefit Quest’s members. For example, I have often spoken with Quest members about the nutritional value of the Gardein brand protein burgers and how they are a lower cost, protein rich alternative to feed to their children. Many of these members were not aware of the product or the advantages to its use. I was so impressed with the Garden Protein International staffs’ enthusiasm for their products and for helping Quest members and staff understand their products. I look forward to the ongoing positive relationship between Garden Protein International and Quest Food Exchange. It is waste redcuction week in Canada. Have you thought about what you can do to reduce your ecological footprint? 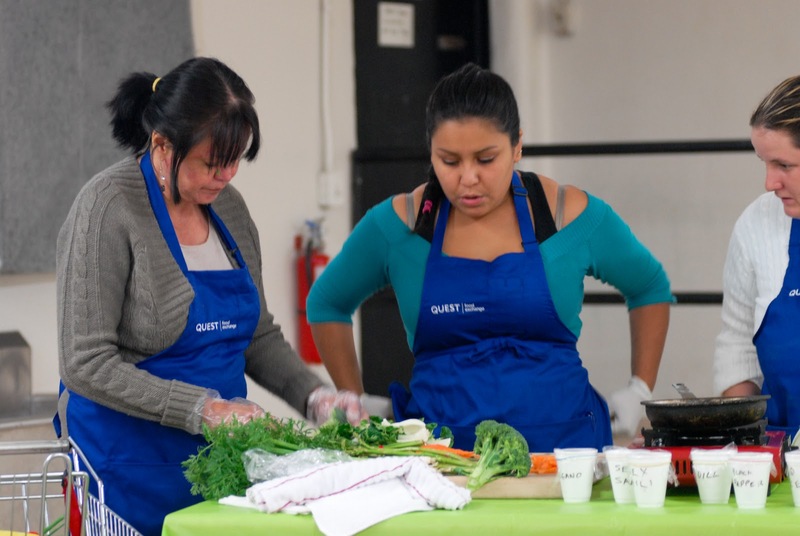 Since 1990, Quest has been reducing hunger and the amount of foodwaste in BC’s Lower Mainland. One of our great partners in this mission is Boston Pizza International, who also happen to be featured on the Waste Reduction Week Website. Check out their case study at http://rcbc.bc.ca/files/u6/BostonPizza_SuccessStory.pdf. If you know a company in the food industry who is trying to find a way to paarticipate in the Waste Reduction Week, point them to Quest Food Exchange. Quest hosted its first Iron Chef Challenge as part of its Partner Appreciation Event on October 14th. The challenge proposed to the participants was to create a meal using only products from Quest. This was to simulate the experience of our clients who have very limited food preparation resources. Each team was given one gas burner, one pan, and two knives. What they lacked in utilities was made up for by the amazing array of fresh produce provided by Fresh Direct Produce. Any cook will tell you that a dish is only as good as the ingredients you start with. Fresh Direct was founded in 2003 by Albert Lum, Davis Yung, and Kam-Chiu Lee, starting with only ten employees and two trucks. By 2008 the have expanded their operations to a 55,000 square foot refrigerated warehouse one hundred employees and sixteen delivery trucks. Over fifteen products were donated for the Iron Chef Challenge: Two types of mushrooms, red and green peppers, broccoli, thin young asparagus and bristling vibrant kale. There were also more exotic items such as gia lan, eggplant, bok choy and pineapple. Plus, cooking staples like Spanish and green onions, garden fresh baby carrots, and romaine lettuce. Fresh Direct has decided to join the Quest family and provide a standing donation for Quest of the same items they provided for the Iron Chef Challenge. Clients of Quest will benefit greatly from having a sense of consistency with produce in the store. “Knowing I can count on those things being in the store week after week makes meal planning for my family a lot easier,” said one Quest client.